Being a Fine Art Portraits Photographer, part of the job is travelling to far off romantic destinations to meet with expats who want the best the can get. I am lucky enough to meet the most amazing people, with amazing stories because of this. Priscilla and Clive are one such couple. Fated to meet, they hadn’t realised that they actually knew each other before they met face to face, and actually spoke for the first time when Clive was hosting a British radio show. Clive had known Priscilla’s mother for years and Clive was mentioned as “the good looking gentleman with the Golden Retriever”. But it wasn’t until later, after the radio show, that Priscilla and Clive met in real life. It was instant. Priscilla is from the Netherlands and Clive is Irish, and they are the perfect match for each other. They love travelling, they love each other, and probably most importantly, they love animals. This is why no expense was spared when it came to including their beloved furry family members in their fine art portraits. Aston is a gorgeous and HUGE specimen of a horse, and most recently featured in an ad for On Call Limousines in Dubai, and I dare say he stole the show! 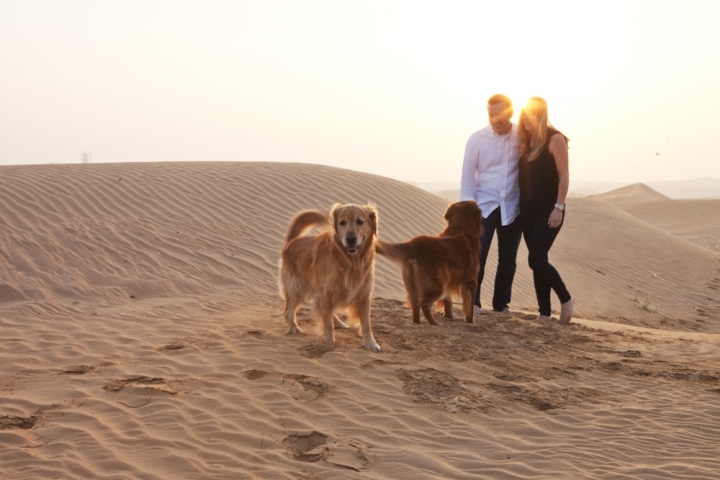 Bentley and Prince are two of the most gorgeous Golden Retrievers and they felt right at home hanging out at places like the Dubai Polo and Equestrian Club, where Priscilla and Clive are active members. We started the day at sunrise in the Dubai desert and ended it at sunrise at the Burj al Arab, arguably the most iconic building in the U.A.E. We even stopped for a lunch session at the One & Only Palm Jumeriah, which has a beautiful view of the Dubai cityscape and Jumeriah Beach. It’s really lovely to be able to set aside a whole day, with no time restrictions and no interruptions. This way, we were able to focus solely on the fine art portraits. The light in Dubai changes extremely rapidly, which you can see evolve in the images below, shown in chronological order. It rained, it was overcast, it was sunny. 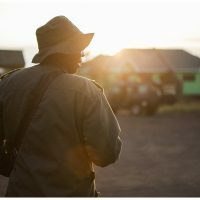 We had every sort of weather you could think of and by the time the day ended, we had seen the pink and warmth of the sunrise, to a brilliant blue sky with the moon still visible, to the cooler blues and greens during the day, to the colourful sunset in the evening. We had it all. For these fine art portraits I used full frame digital, 25mm film and medium format film with Canon and Mamiya cameras. All 3 mediums give different results but all 3 are also very beautiful. I specifically like the way the Kodak Portra 400 film handles the harsh midday sun in Dubai. It took the harshness and completely tamed it into submission, making sure there were no ugly shadows. Even when it was overcast and raining during lunch, the Kodak Portra 400 produces beautiful colours.